I’m super critical of any dish with chicken in it, probably because it’s the protein we ate the most of when I was growing up, the one I know the taste profile of by heart. When my mom was on form there was nothing in the world like one of her juicy, bursting with flavor whole roasted birds. But when she was tired, it often became dinner by default, dry and tasteless as cardboard (sorry mom. Love you.). Even the texture changes in poultry when it's not cooked to perfection, which to my mind is just the far side of pink. Hang around kitchens and you’ll learn that while good chefs can prod any protein and know if it’s the witching moment, great chefs can tell just by looking. With poultry, often the hardest to discern, Ryan can tell from across the room. He’s just a great chicken chef ~ even with a small poussin, his brigade consistently produces birds that have crisp skin with hits of briny salt followed by moist meat that is the essence of comfort. When Chef said he was going to do a Chicken Fricassee for Dish of the Week, I was somewhat surprised. Fricassee is basically a stew, which in my experience can only ever be, at its best, a satisfying mess. The classic recipe calls for a good number of vegetables and a protein, usually chicken, cooked together and served together. Great stew recipes invariably run the risk of losing the unique taste profiles of singular ingredients. In general you don’t say the word ‘stew’ and think ‘vibrant distinct flavors.’ Comfort, yes. Elegant presentation, no. I know Ryan: vibrant flavors and elegant presentation is usually what he is after. He pointed out that while many great chefs ~ think Boulud or Bouley ~ might rely upon adding ingredients slowly to the pot to the build flavor in a stew, he preferred the Thomas Keller approach ~ prep each ingredient separately in order to vary and control how each was cooked, and with what herbs, oils and spices (if any). The flavors, colors and textures in this fricassee only met up when they slid into the pan for that last hit of heat ~ with a few knobs of butter and confit garlic ~ a few minutes before plating. 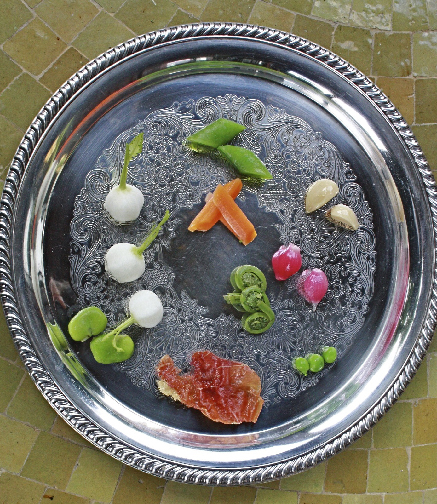 Here’s what I tasted in Ryan’s Summer Vegetable Chicken Fricassee, which in honor of its humble origins I ate straight out of the skillet: the favas and fiddleheads were punchy, green and earthy, the baby red onions bright and vinegary. 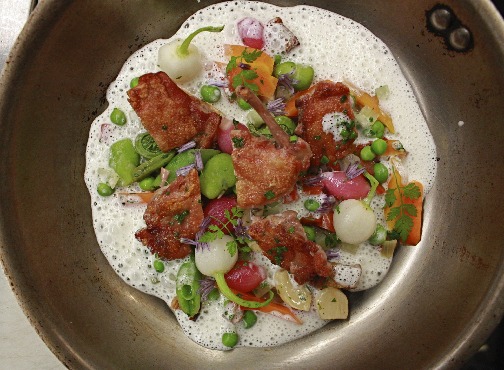 Nuggets of bacon were salty and chewy, while English peas and Nantes carrots, despite being different shapes and colors, shared a delicate garden flavor profile. 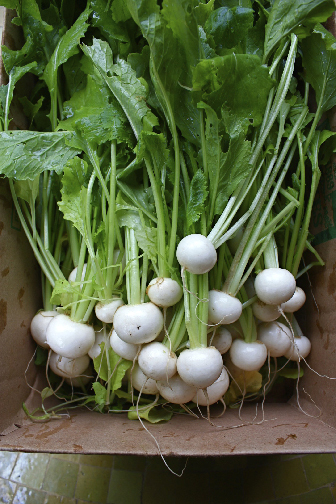 The stand-out vegetable were the Tokyo White Turnips Myrna Fincher of Earlybird’s Place had dropped that morning in a plain brown box. To my eye these white jewels with their bright green stalks would not have been out of place in the window at Tiffany's . Ryan simply steamed them, taking care to leave them with a juicy crunch that was rooty and beguilingly sweet. 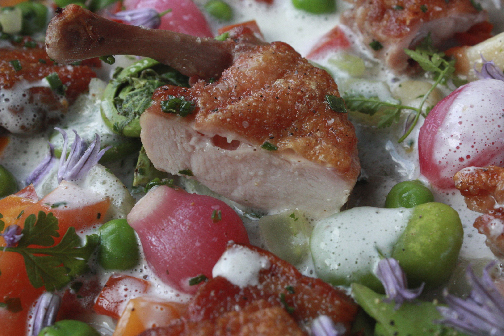 To this vegetable mélange he added the whole poussin which had been pan seared to a golden hue. No doubt a rainy Wedding Day gives pause, especially one that’s been anticipated to unfold in “sunny” wine country. 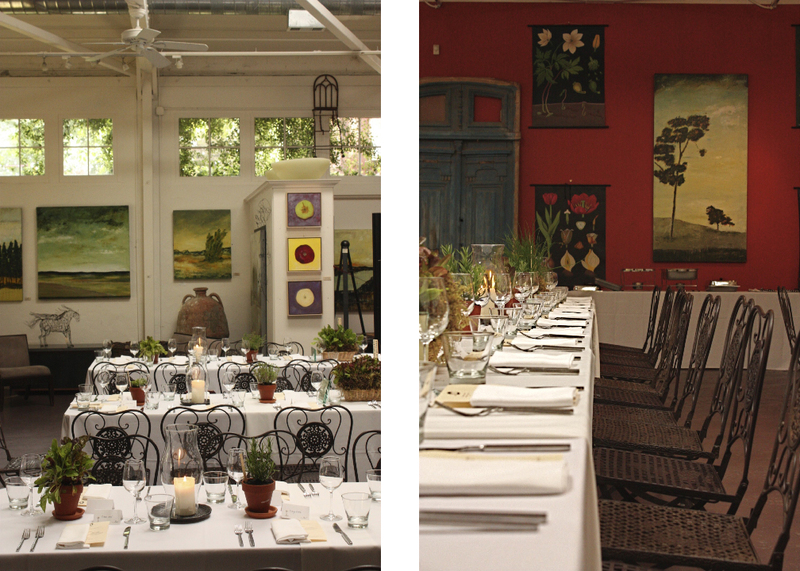 But I must say I find something very special ~ as in beautiful, intimate, memorable ~ when we have a ceremony inside the Barn, with dinner in the Gallery, as we did this past weekend thanks to tumultuous thunderstorms. Happily, as our Saturday couple, Allison and Shaun, have strong ties to Healdsburg and had it in their hearts to be married at Barndiva in great part because of out commitment to the food shed, the symbolism of their ceremony ~ beneath the crossed pitchforks in the Barn filled with Dragonfly flowers and lit by a dozen tapers ~ was right on (and pretty wonderful). Something about the space makes every word clear and distinct, so it was especially dramatic when the hush that descended on the perfumed warmth of all those in attendance exploded with joy when Lukka pronounced them husband and wife. It was the bride’s inspired idea to have table arrangements of summer salad greens and herbs that could be taken home and used again to flavor future meals of those she loved ~ a small, beautiful, mindful detail that bodes well for their future, rain or shine. 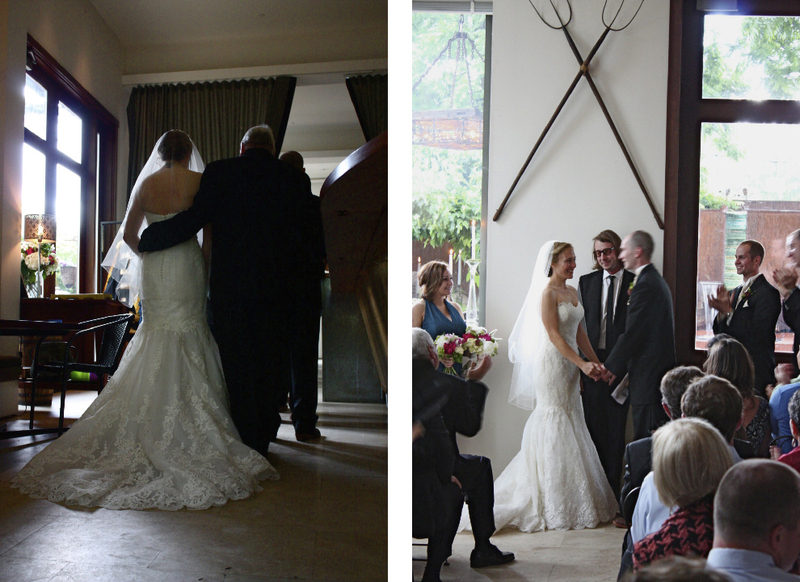 If you love looking at weddings, here’s a link the wedding of Laura and Charles last week. Though in this case the sun came out briefly on the day, they were married in the gallery by choice, and it was intimate and wonderful. Some great shots by Flory Photography. Thanks for sharing! Healdsburg Chamber of Commerce President Mo McElroy introduces the irrepressible Clark Wolf who was a funny and charming MC for the Early Summer Farm Forum hosted by Barndiva last Thursday. 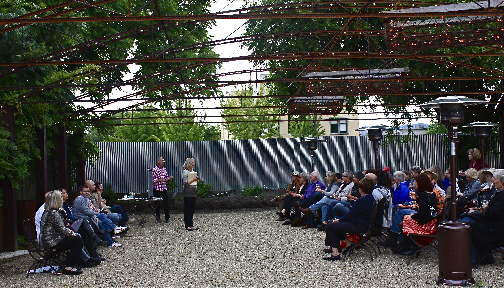 In the only break in the weather all week, even the sun came out to hear about a wide range of farm, garden and culinary programs that make a difference in so many lives here in Sonoma County. How we might affect the controversial Farm Bill which goes before Congress in 2012 was just one of the many issues discussed by an information rich, forward looking line-up of speakers who addressed a group that had as many local luminaries in the audience as on the dais. 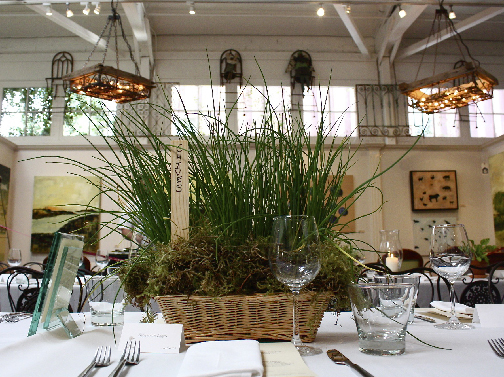 And as it turned out, The Forum took place the same day Edible Marin's All Hail Soil summer issue was published, with a feature about last fall's Taste of Place dinner which was truly an edible exploration of many of the subjects discussed at the Forum. We love Edible (and its editor Gibson Thomas) because rain or shine one can feel the commitment to the health and well being of the Northern California Food Shed on every page. Check out the issue using the link below, or better yet pick up a hardcopy at the Studio or in the restaurant next time you are in town. All text Jil Hales. All photos, Jil Hales and Dawid Jaworski (unless otherwise noted).